Dry eyes can put a damper on your day. The itch, irritation and the gritty feelings are distracting, and irritation can get so bad as the day draws on, that it can border on painful. If you’ve suffered from regular or seasonal eye dryness, you may have noticed that the irritation worsens throughout the day and peaks at night. Your dry eyes may have kept you from attending a special evening out or joining friends after work. Fortunately, you may not have to live with dry eye pain at night and miss out on fun activities any longer. 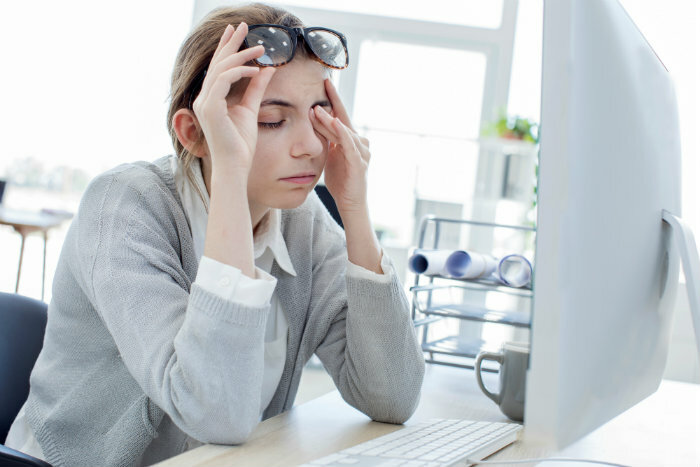 This article explores the causes of eye dryness at night and the steps you can take to reduce or rid yourself of the nuisance. Before going into the specifics of night dryness, let’s look at what can cause eye dryness. The causes of recurring dry eyes vary widely. A common underlying factor of dry eyes involves tears – not making enough of them, having poor tear quality or rapid tear evaporation. With each blink, the underside of your eyelid spreads moisture over the cornea. If there aren’t enough tears, your cornea gets dry and irritated. There’s also a connection between dry eyes, inflammation and metabolic disorders according to a published study by the U.S. National Library of Medicine National Institutes of Health. The results suggest that adult females with metabolic disorders may also have dry eye syndrome. Another dry eye disorder is called “nocturnal lagophthalmos”; it’s the inability to close eyelids completely during sleep. This is caused by facial palsy, deformity of the lid or incomplete healing from eyelid surgery. Because the surface of the eye is exposed during the night it becomes dry. Health disorders can also result in dry eyes, including Sjorgen disease, Sarcoid disease, diabetes, thyroid problems and sleep apnea. Some women experience dry eyes due to hormonal changes associated with menopause. The American Optometric Association (OAO) notes that aging, and taking certain medications including antihistamines, decongestants and blood pressure drugs, can cause dry eyes. LASIK surgery and long-term contact lens use can also contribute to dry eyes. Working or living in a smoky, dry environment can also cause tears to evaporate rapidly and dry the surface of your eyes. Computer use can also make your eyes drier because you may not blink as often when looking at a computer screen, causing rapid tear evaporation. Why do my eyes feel drier at night? After using them all day, your eyes are naturally dried out. But, there are other causes. One theory involves how the body’s metabolism changes at night. Body temperature drops one to two degrees as bedtime nears, and metabolism slows during sleep. Because body functions slow, blood circulation slows and there are fewer nutrients reaching the eye and fewer tears being produced. As mentioned earlier, incomplete eyelid closure during sleep can also contribute to dry, irritated eyes. There are many over-the-counter remedies that relieve the irritation of dry eyes at night. Also, if you address the symptoms related to dryness during the day, you can limit the irritation of dry eyes at night. Start with lubricating tears, gels and ointments. Follow the instructions carefully. If you’d like to help preserve moisturizing tears at night, choose a viscous eye gel that is meant to coat the eye at night. The thickness could interfere with clear vision and should be applied at bedtime. If dryness is caused by eyelids that don’t close completely, a barrier, such as a sleep mask or eye seal, can help to retain moisture on the cornea. Lifestyle changes can help prevent dry eyes, such as limiting computer time before bed. You can also put a humidifier in several rooms in the house, including your bedroom, to add moisture to the environment. If you’re not able to get fast relief from do-it-yourself methods, consult a medical professional. In fact, it may be best to consult your eye doctor first to identify the cause of dry eye, particularly if it’s an on-going issue. Your eye doctor may prescribe medication, and for severe conditions, your ophthalmologist may recommend other dry eye treatment options, such as punctal plugs inserted into the tear ducts to keep the tears from draining out of the eye. Is it time to put together a plan to correct your dry eyes? Request an appointment with the eye doctors at Barnet Dulaney and Perkins to help correct vision problems and improve the quality of your life.